It can be stressful setting on a tradesman you have not dealt with before but sometimes you hit the jackpot. I have recently had a multi fuel fire and surround fitted by Phil Paling. Another company had advised that what I wanted was not possible and suggested another design that my wife and I did not like. When Phil came to do an initial survey he said that he could see no problems in fitting what we wanted. His workmanship was 1st class and although it was a job that created some dirt he cleaned up thoroughly as he went along. I have no hesitation in recommending his company for all types of Plumbing work, from the simple things to the more elaborate. Well done Phil and his team. "Phil fixes our fireplaces for us and also installs gas heaters for us. We are always happy with the work that he does and find his prices to be very reasonable. He is extremely well qualified and I would highly recommend the service." 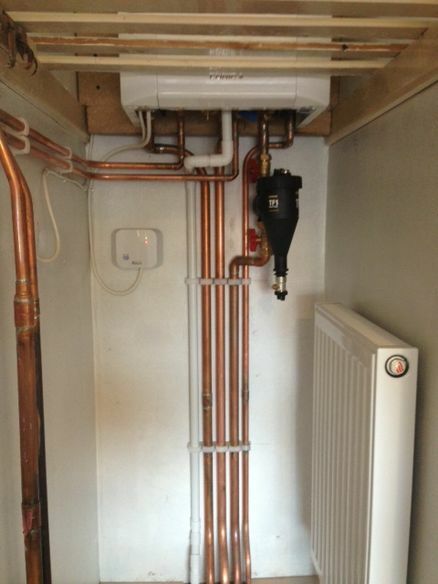 "Phil fitted the heating in my bathroom and I am very happy with it. He was highly efficient, extremely tidy and I would absolutely recommend him." Combi boiler and stove installation. Punctual, polite and professional. The whole team bent over backwards to please. Cannot praise enough. Highly recommended. Paling Plumbing and Heating were highly recommended by the manager of Reeds Rains estate agents to remove a hot water tank and associated pipework in the kitchen and replace with a new combi boiler. We also needed a new en-suite creating and a bathroom updating. Phil Paling gave us a detailed plan of the required works together with good practical advice and a realistic and acceptable estimate of the cost. Carl, Luke and James did a thoroughly professional job carrying out the work and were a pleasure to work with. They were polite and clean and tidy workers and nothing was too much trouble for them. The boiler and bathroom units supplied were all good quality and fitted with the utmost care. They also fitted a new fireplace and gas fire for us at a most reasonable price. We will use them in future and recommend them to everybody. Excellent service (from the design to the finish), Phil (owner) gave us advice on fixtures and fittings (no hard sell just good advice on what would work best in the space we had). Full itemised quotation (no hidden costs). We had a new suite fitted , new flooring, new ceiling and walls tiled. 5 days to complete (left them with a key while I went on holiday) came back to a gleaming contemporary bathroom. As for his team - courteous, friendly and hard working (explained how everything worked before leaving ) mess all cleaned away (never have known they'd have been ). They also fixed a gas leak I was unaware of (no charge) and my leaky tap in the kitchen . As for price, excellent value for money for the first class service they provide. We had a multi-fuel Tiger stove installed and gas pipes relocating. Very professional service from start to finish. Lovely set of lads who always answered my many questions. Would recommend these to anyone who are wanting a top job doing right. Phil Paling advice & planning was excellent . Engineers polite professional quality of workmanship was 1st class everywhere was cleaned after each job.